In the spring of 2015, the Opus Chorale had the amazing opportunity to give the American premiere of a new setting of the Requiem Mass composed by Norwegian composer, Kim Andre Arnesen. Since then, Opus has developed a close relationship with Kim and is committed to performing Kim’s music whenever possible. Because of this relationship, Opus entered into an agreement with Kim for a new choral work based on Psalm 121. The work is 5-6 minutes in length and is a mix of texts from Psalm 121 along with modern poetry written by Euan Tait. The organ plays a key role in this work, and the choir divides into 8 vocal parts. The style is much like the style of the great Angilcan anthems of Parry and Stanford, but composed in a style unique to Kim. The anthem was completed and in our possession by August 1, 2016 and was premiered in our winter concert in December, 2016. After our premiere, and after some final editing, the anthem, entitled, “The Eyes of the Heart,” was released by Santa Barbara Music in 2017 and is available through them, or the JW Pepper Music Company. Click on the link below to see the score and hear the Opus Chorale perform this choral work, which was recorded in the sanctuary of Christ Church United Methodist in Charleston, WV. It is a wonderful celebratory anthem for anytime, especially for All Saints Sunday. The poetry by Euan Tait includes places where the text can be personalized for any situation. The anthem was commissioned in memory of our colleague and friend, Carol Eich, who served as our accompanist a few years ago. Carol was a college professor and church organist in Charleston her entire career before she passed away in 2015 after a short battle with cancer. Carol passed away the same weekend as our Arnesen Requiem premiere in April of 2015. Living in the mountain state of West Virginia, Psalm 121 was Carol’s favorite scripture. 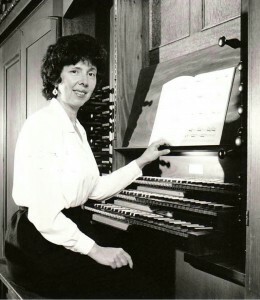 Here is a picture of Carol Eich at the Fisk organ located in the First Presbyterian Church, Charleston, WV.